There’s a saying in Hebrew, he tells her. there’s always a thread of grace. 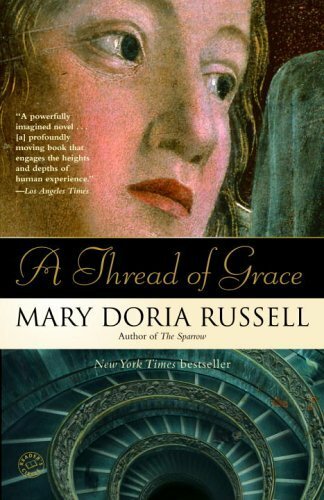 Mary Doria Russell’s A Thread of Grace is a dense book. When I read it half-heartedly-dipping in here and there–I just couldn’t muster any enthusiasm. There are many characters and more storylines than a modern novel usually has. The place names are unfamiliar (many are fictional) and it is easy to become lost, dislocated. Like Dostoevsky or Tolstoy, it takes a while to settle in and get comfortable. determined not to commit the sin of despair. After I finished this story of the Jewish resistance in Italy, sniffling and throat-lumping, I count it in the top five books about civilian life during WWII. Russell (who grew up in my hometown, Lombard, IL) obviously knows both Jewish and Catholic culture deep down at the roots in this well-researched and well-written story. utterly transforming the homely face. To make a man so happy! she thinks. The courtship of Claudette and Santino, written with sparse, elegant prose, remains long after the book is finished. Santino, a solid man, builds stone walls that will be standing 200 years after he’s gone. Claudia (she Italicizes her name) is a young refugee who is forced to grow up in a short space of time. Like any book with Nazis and Jews, there is difficult-to-digest terror and violence. The old words come back, prayers he learned as a child. Have mercy on me, O God, according to the multitude of thy tender mercies. The other relationship which barnacled my heart was between a Catholic priest, Osvaldo Tomitz, and Werner Schramm, a German Doktor who has deserted the Nazis. The story begins with Don Tomitz hearing Schramm’s confession–who calculates that he has killed 91,867 people–and ends with Schramm acting as a priest to the father. Don Tomitz wrestles with guilt, forgiveness, atonement and absolution as he ministers to broken people. May I share some of my favorite sentences? ~ Shutters open like windows in an Advent calendar. ~ He could give a lecture on the natural history of terror. ~ He tries to thank God, but can’t help feeling like a thug’s wife who believe she is loved if a punch goes wide. ~ Autumn light makes the varnished chesnut bookcases beneath the windows glow. I love this quote: “His face twists, but he holds back the tears, determined not to commit the sin of despair.” It puts so beautifully what I have done too many times in my life…and am thankful for that thread of grace that keeps me going. Thank you for this review. Beautifully written. This sounds like a truly beautiful book. You are frightening me, since I have to cover WWII with los kiddos this year. I’m not sure I’m adult enough to digest how folks wrestled with the horrors- how can I guide los kiddos? What fearsome challenge to stop modern horrors will then face us? This sounds fascinating. I’ll get it up on War Through the Generations soon. I’m playing catch up on that site. @LimboLady – Yours is one of the best comments I’ve ever received. Thank you. @Jbbs_Musings – That was an informative article. Thanks for the link. I have *not* read her other books. For me, science fiction is in about the same space as rap music. Meaning, I avoid most of it. I try to read some occasionally, just to see if my opinion has changed. I think I like “fantasy” better than sci-fi. I’m sure I’ve passed over excellent books. As an adolescent I couldn’t make myself read “The Hobbit” because, what exactly is a hobbit? It wasn’t until my sons’ friends were hanging at the house throwing quotes back and forth that I realized I needed to pick that book up and read it.I remember a moment back in the early nineties when it occurred to me that every sci-fi book still has some sort of conflict, usually moral choices involved. It was a breakthrough for me. I wrote about The Sparrow here. I was quite impressed. It looks as if Ms. Russell is an author I’ll have to look for when I go to the library next.